First up, the iPhoto for iPad app is $4.99, which is surely not going to break the bank. Included with iPhoto are many of the pro-sumer level effects that should meet the needs of most, if not all, non-professional photographers. Download the app from the App Store right away to follow along step by step. Cropping photos well is a basic yet underutilized editing technique that most photographers do first. 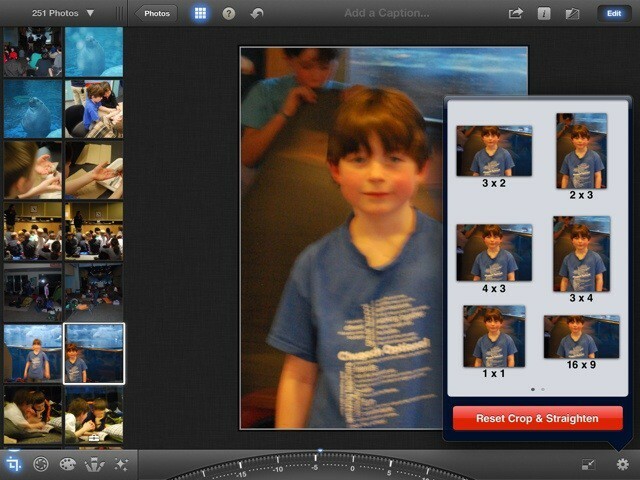 In iPhoto, tap the photo you’d like to crop and tap, well, the Crop button in the lower left of the screen. Touch the image, then, to crop it. you can twist your fingers to rotate the photo, tap and drag the crop handle by its edges, or just pinch in or out to adjust the photo size relative to the frame around it. You can also tap the gear icon to choose a preset image ratio (like 4 X 3 or 5 X 7). Color correction is another quick way to make good images great. Select a photo, then tap the palette icon in the lower left of the screen. Touch the area in the image you want to adjust, and iPhoto will auto-magically know if you’re touching blue sky, skin tones, or green scenerey, and adjust accordingly. When the adjustment handles appear, you’ll be able to drag your finger left or right to adjust that specific color in the image. Touch anywhere else in the image and you’ll be able to drag your finger up or down to saturate or desaturate the color in the whole photo. Look below the photo to adjust colors with the four sliders along the bottom of the screen to adjust the saturation, blue skies, greenery, or skin tones for the whole photo. There are even some preset color adjustments you can do by tapping the White Balance (WB) icon in the lower right. Just choose a preset, like Cloudy, Incandescent, or Sun, to adjust the image accordingly. Photo editing is all about making changes to the visual image, using your own aesthetic preferences to make the picture just that much better than the original. 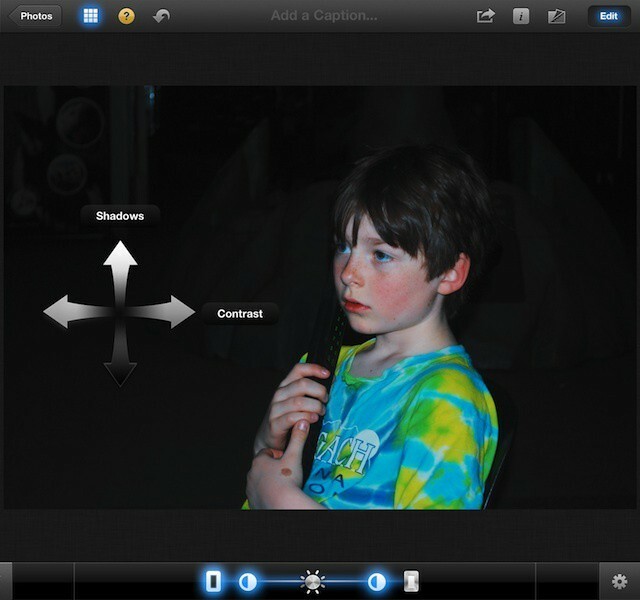 With some simple tricks in iPhoto for iPad, you can make that good photo better, and that great photo sing. iPhoto has three tools that you can use to do just that. Brighten, Zoom, and White Balance. While the features may be fairly intuitive, it never hurts to point them out, as not all of us are intuitive in the same way. Brighten up your photos in two ways. First of all, you can adjust the brightness of the entire photo. Launch iPhoto and choose the photo you’d like to make brighter, or darker, if that’s your thing. We don’t judge. Tap the Exposure button in the lower left. That’s the second icon from the left; it looks like a little aperture symbol. Tap on your photo where you want to adjust the brightness and iPhoto will figure out if you’re touching shadows or highlights. Drag your finger up or down to brighten or darken up the photo, respectively. You can also just use the sliders along the bottom, dragging the sun-shaped button to the left or right. You can also drag the little half and half buttons to change the contrast, or the outer rectangular buttons to adjust the shadows and highlights. The Face Balance setting can be found by tapping on the palette icon, third from the left in the lower left corner of the screen. Choose your photo and tap the second icon from the far right, which will be different depending on where you left it last. The WB button stands for white balance. Tap on a face or skin tones in your photo, and drag up to saturate, down to de-saturate. Drag right to increase skin-tone warmth, and left to decrease. This is where your own preferences will come in, as each photo is different. Finally, as you are doing all this post-processing, you’ll want to see how your changes look close up. Use the loupe to do so. Simply press and hold on your chosen image with two fingers and a big circular area will appear. This is the loupe, a digital version of the simple, small magnification device used by watch and jewelry makers to see small details more closely. Drag your two fingers around the photo to see, up close, the changes you’ve wrought. 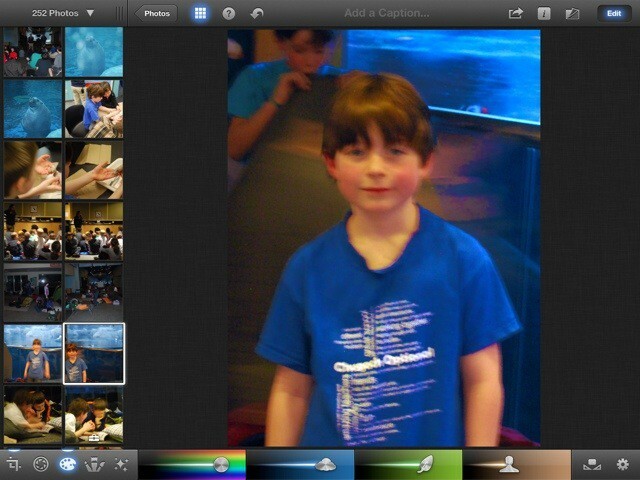 First up, launch iPhoto for iPad and find a photo you want to fix the red eye in. Tap the photo to bring it up into editing mode, then tap the Brushes icon in the lower left of the screen (fourth icon from the left). A fan of brush tools will pop up from the bottom of the iPad screen. Tap the one that says “Red Eye” on it. Then tap directly on your photo subject’s eye. Be sure to zoom in with a pinch out gesture to apply the effect more easily. iPhoto will automatically detect the red eye in the photo and fix it for you. Easy! Blemishes are just as simple to repair. Find the photo you want to fix, and bring up the brush tools again. Tap on the Repair brush, and then rub your finger on the skin of the person in the picture. 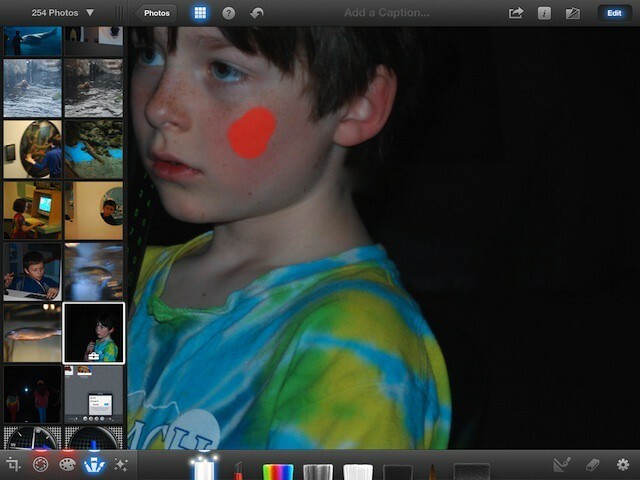 iPhoto will place a red color overlay where you rub to help you know where you’re repairing things. If you want to make the brush smaller, zoom into the photo with a pinch out gesture before you start the repair rub. This makes the size of the Repair brush smaller in relation to the picture itself. iPhoto has several Special Effects ready to play with, accessed with a tap on the little sparkly icon, the fifth from the left in the lower left corner of iPhoto on the iPad. Tap that, and a fan of special effects swatches will rise up from the bottom of the screen. There are six filters there, including Warm & cool, Duotone, Black & White, Aura, Vintage. and Artistic. Tap on a swatch you’d like to apply, and then tap or drag along the strip to select the effect that you prefer. Many of the filters can be further tweaked by pinching or dragging around in the photo itself. For example, the Vignette effect, found at the right within the Black & White strip, can be enlarged with a pinching out gesture, and moved around to a new center point with a simple drag. Play around and have fun here. Tap the question mark icon at the top for a tooltip for each of the effect swatches. Once you’ve got the effect the way you like it? You can copy that effect with a tap on the little gear icon at the lower right of the effects screen. Tap Copy Effect when in the photo you’ve just perfected all your effect tweaks in. Then open a different photo and enter Special Effects mode. Tap the gear icon again and then tap Paste Effect. Boom! Your masterpiece set of effects will be applied to the new photo. Got too many edits? You have three ways of going about undoing them. First, you can remove all the edits from a photo by tapping the gear icon (you might need to tap the Edit button first, though). Then you’ll see the Revert to Original button. Tap it! The second way is just for when you want to undo specific effects on the photo. Make sure you’re in Edit mode in a photo that has edits in it, then tap any of the editing icons you’ve used (the ones in the lower left). Hit the gear icon in the bottom right and tap Remove Effect. The end, all gone. When you’re all done with applying all the effects and edits you want, go ahead and tap and hold on the Show Original icon in the upper right of your screen, right next to the Edit button. This will drop an overlay of the original photo on top of your edited one, so you can see the final difference. Stop tapping the icon to make the overlay go away. 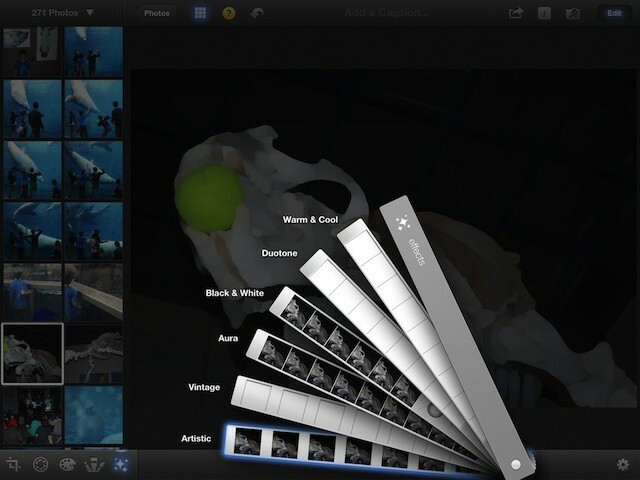 Simple sharing, via email, Facebook, Flickr, and Twitter is built right in to iPhoto for iPad. Tap and select a photo to share it, or tap and hold many photos to select more than one. Or simply tap the gear icon and then tap “Select Multiple…” You’ll be able to tap more than one photo in the columno n the left of iPhoto. All the photos you chose will show up in the main window, tiled if multiple selections. Hit the sharing button, which is the standard iOS sharing button in the upper right, the third from the right next to the Edit button. Tap on the icon of the service you want to share the photo or photos with, like Flickr or Facebook. If you haven’t done this before, you may need to log in to the specific photo sharing service, so follow the prompts as you go. ONce you’re all signed in, hit the Share to button and you’re good to go. Beaming your photos is a nice option, which we’ve covered before. Select the photos you want to share as before, but hit the Beam button, with the little WiFi rainbow icon. If you have iPhoto up on the iOS device you’re sharing to, say a friend’s iPhone, you’ll see the device pop up in the Beam options. Simply tap it to send the photos you’ve selected to the other iOS device. One of the more interesting ways to share your photos from the iPad is with the Journal option. This is like a digital scrapbook that you can hand as a slideshow to a friend on your iPad, send to iTunes, or share out as a web page via iCloud. 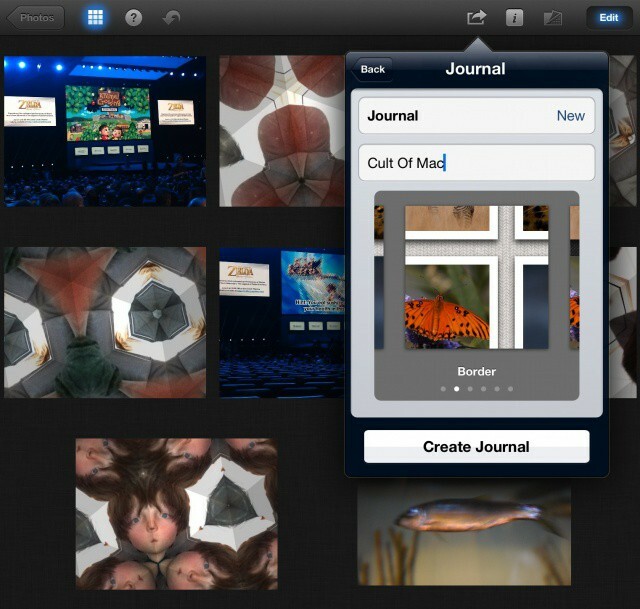 To create a new Journal, select the photos you want to put into the journal with a tap/hold to select multiple photos. Then tap on the Share icon in the upper right. Tap on Journal, and iPhoto will give you the option to use the ones you’ve chosen, choose more, and then, once you tap through, the chance to name your Journal and chose a theme. The themes are basically the material that shown behind the photos in the Journal, like Cotton or Denim. You can add these to an already created Journal at this time as well by tapping on the Journal/New field. Once you tap Create Journal, then Show, you’ll have the chance to move the photos around, tapping on each one to resize, and adding captions. It’s all very slick. When finished, tap the Share button in the upper right and you can export it as an iCloud web page, a Slideshow, or an iTunes movie.